A family’s pain has undoubtedly been exacerbated by what appears to be an insensitive oversight by financial giant, Republic Bank Limited (RBL). 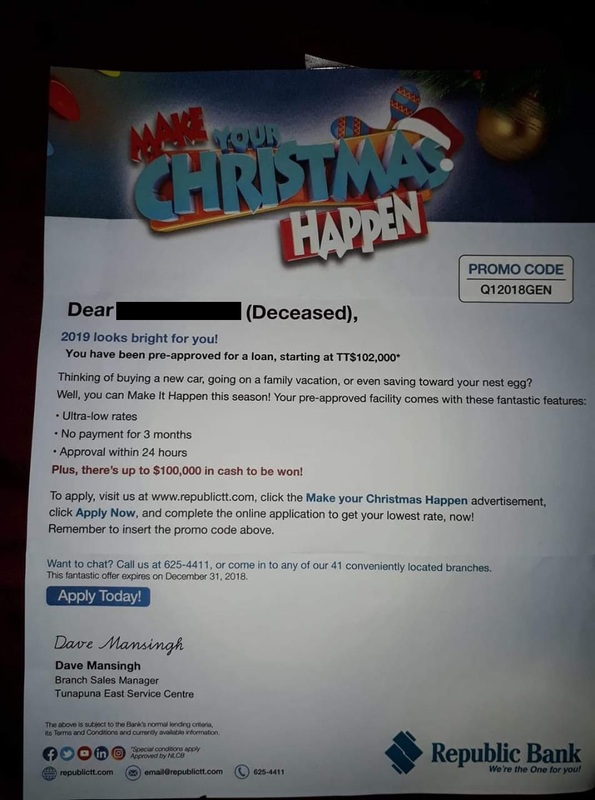 This follows numerous social media posts and messages regarding a ‘Make Your Christmas Happen’ loan sent to a deceased customer. The letter began with, ‘Dear *** **** (Deceased), 2019 looks bright for you!’. It goes on to advise the deceased woman that she has been pre-approved for a loan valued at $102,000. The letter was signed by Tunapuna East Service Centre, Branch Sales Manager, Dave Mansingh. Many social media users have criticised the bank for the letter. Loop TT reached out to the bank for comment and was informed that the Corporate Communications Department closed at 4 pm.